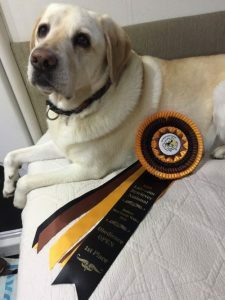 Meet Dora the Kleenex Puppy showing off her prizes after winning the obedience competition at the 10th National Labrador Retriever Championships. Her real name is Neutered Champion Tapua Honey Gem CDX NRA RE. Pittwater Vets have looked after Dora since she was 8 weeks old. Dora did puppy school with Louise, which set her up well to feature as the Kleenex puppy. Sadly for us, Dora is now moving to Grabben Gullen near Goulburn to enjoy a tree change- we wish her all the best.